Corona, CA - March 15, 2019 Corona’s premium grade, stainless steel garden tools with ComfortGEL® grips are built to work as hard as you do. They are the most comfortable ergonomic grips in the garden, featuring large diameter, reinforced square tangs and welded joints forming exceptional tool heads and blades that are built to last. The premium grade stainless steel cleans up easily after each use and resists rust for years of lasting performance. Corona is putting comfort into the hands of gardeners across the country, and making it easy to soil with the introduction of these new, comfortable, premium hand tools. Premium Stainless Steel ComfortGEL Trowel CT 3314 [$13] Planting at the right depth is no problem with the easy to read, integrated depth marker. ComfortGEL® Trowels also feature an easy to use soil bag ripper and a finger guard to protect hands. 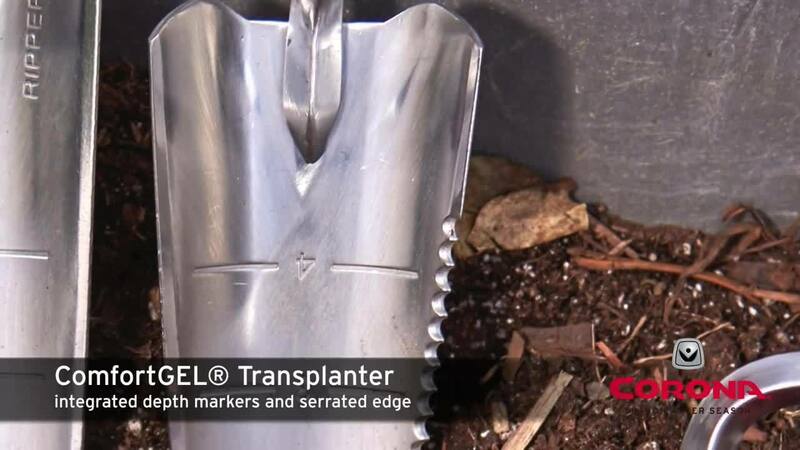 Premium Stainless Steel ComfortGEL Transplanter CT 3324 [$13] perfect for transplanting smaller plants in tight spots. The serrated edge cuts through root balls to stimulate growth, the depth gauge insures precise holes, and the finger guard shields hands. Premium Stainless Steel ComfortGEL® Cultivator CT 3334 [$13] 3-prong stainless steel Cultivator head fits into tight spots to aerate and loosen packed soil, dislodge small weeds and mulch around young plants. The cultivator also smooths soil in beds and planters like a small rake. Premium Stainless Steel ComfortGEL® Hoe/Cultivator CT3344 [$13] With dual heads, this multi-purpose Hoe/Cultivator acts as a sharp hoe to break up clumpy soil as well as a cultivator for weeding and a planter for annuals. Not too heavy, its stainless steel head is multi-purpose. Premium Stainless Steel ComfortGEL® Weeder CT 3354 [$13] the 2-prong end of Corona’s Weeder efficiently pierces the soil. Taproots are no match for the 2-prong Weeder that slices through soil and extracts weeds, roots and all. The serrated edge is great for cuttingweeds at the soil line or below. Premium Stainless Steel ComfortGEL® Scoop CT 3354 [$15] Move large amounts of soil, amendments and more with the large, heavy duty Scoop, handy for a wide variety of garden, home and ranch tasks. The large stainless steel scoop has a wide, deep shape to insure careful transfers with minimum spillage. Try it for scooping potting soil into hanging baskets and pots, or lime into a spreader. It’s also great for pet and livestock food, kitty litter, ice melt, fertilizer and you name it! Corona Tools was born in the orange groves of Southern California in 1928. Our roots began with an invention that revolutionized the citrus industry. Since then, we’ve been designing superior garden and landscape tools for hard working professionals and gardeners, who take pride in a job well done. For generations, our customers have relied on Corona’s strength and durability. For over 90 years, Corona has established itself as a leading professional tool brand, primarily within North America. Part of the global Venanpri Tools family of hand tool brands, our tools are carried in retail stores, local garden centers, and landscape, agriculture and arborist suppliers. For more information, visit www.shop.coronatoolsusa.com. Find Corona Tools on Facebook, Twitter, and YouTube. Venanpri Tools is a global collective of the finest hand tool brands for agriculturists, horticulturists, gardeners, landscape and construction professionals. The cumulative experience of the Bellota, Burgon & Ball and Corona brands represents nearly 500 years of advancement in developing superior hand tools. With a global footprint spanning more than 125 countries across 6 continents, our brands have been the leading choice for generations of professionals who rely on quality and lasting performance.